Deploying servers into production and organizing a well-constructed orchestration setup can be challenging. At GoDaddy, the process of getting servers deployed into production was once a drawn out, manual process mainly driven by support tickets. By utilizing a continuous integration pipeline, orchestration tools, and transitioning to microservices, GoDaddy has cut its time to market drastically, where developers can deploy servers into production in less than a minute. In this episode of The New Stack Analysts podcast, The New Stack founder Alex Williams and co-host Scott M. Fulton III learn about GoDaddy’s transition to a more automated production pipeline. 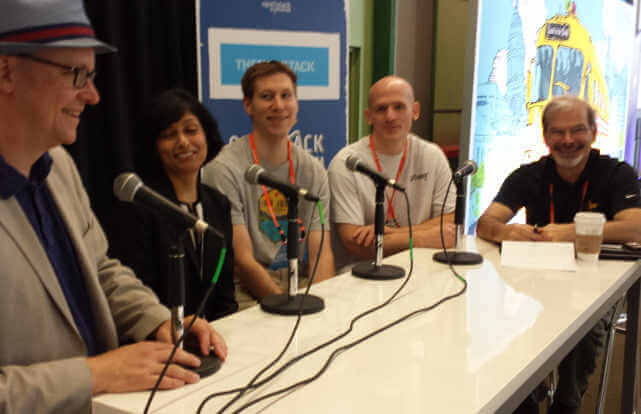 They are joined by Shaheeda Nizar, GoDaddy senior director of OpenStack engineering; Josh Harlow, GoDaddy OpenStack tech lead; and Kris Lindgren, GoDaddy senior Linux systems engineer. Lindgren noted it used to be extremely difficult to set up servers at GoDaddy before the company had implemented automation. “There was a lot of waiting on other teams. Everything was open a service ticket with someone else in wait and hound them to get stuff done. Everything was manual. There were no APIs or UIs to interface with a lot of services,” Lindgren said. GoDaddy’s team knew something had to change. That something was bringing on OpenStack. Initially, GoDaddy’s infrastructure didn’t run on OpenStack, so they soon shifted to working with the open source community, a strategy which had been successful at Yahoo. After the switch, the GoDaddy team tried to solve problems by creating better create tools for automating their production pipeline. Throughout the ongoing challenge of implementing a solid orchestration setup, GoDaddy has faced its share of challenges. Nizar highlighted that the task involves a team effort, bringing together multiple departments that work to identify and eliminate unnecessary steps in their current processes. “There’s still a bit of toolchain around deployment process and common things that were done that need to be incorporated,” she noted. Where many companies have built monolithic applications, GoDaddy has begun to transform its architecture into a distributed system with a fleet of microservices. “It’s built on a shared nothing architecture, so deployment was easy and resilient,” Nizar said, noting that it hasn’t come easy. The work involved was a long and challenging transformation, comprised of deeply technical work as each service was created. Nizar further explained that even as the infrastructure piece was completed, there was more to do. The next step in improving its infrastructure involved setting up GoDaddy’s product team with the right architecture, then getting team members to start building microservices for their workflows. Rarely do companies mention the work involved in transitioning to microservices, unifying teams to complete common goals, and building new infrastructure. Companies considering adopting microservices might feel frustrated when their setup is a challenge, as opposed to a ‘click-and-done’ setup they might have been expecting. Fortunately, Nizar, Harlow, and Lindgren explained how that hard work paid off in this episode. Feature Image (Left to right): Alex Williams, Shaheeda Nizar, Kris Lindgren, Josh Harlow, Scott M. Fulton. Photo by Judy Williams.